My Rating: Good Read, Too Funny! Synopsis: The Sweet Potato Queens® are back and bawdier than ever in Southern belle extraordinaire Jill Conner Browne’s ninth edition of the hysterical series. Having experienced pretty much ALL of the crappy parts of life, Browne feels it is her duty to render whatever assistance she can to her fellow sufferers — and she does so in her own inimitable fashion. Her father taught her there are very few situations in life that we really and truly cannot change, and it is up to us to figure out how to either make fun OUT of them — or make fun OF them. And fortunately for the rest of us, Browne is well equipped for both. * Thinking or talking about watermelon can save any negative situation. * If you get drunk in Scotland, you can’t have your cow with you. * When sanity and reason fail, you can always cheerfully resort to ridicule. * Denial means that every situation is perfectly perfect. More fun than a Cracker Barrel full of monkeys, Fat Is the New 30 will change your life — or at least give you ideas for making fun of your ownself. My Review: I might be the only person who has never read a Jill Conner Browne book before, but I am sure glad I finally have. 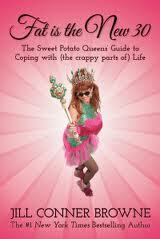 This Fat is the New 30, the Sweet Potato Queen's Guide to Coping with (the crappy parts of) Life is too funny. I have to share with y'all some of my favorite chapters. Fair and Square: In this chapter I love the part where Sweet Potato Queen (the Queen) describes how to handle "one of many indignities of aging"......Remembering what you were talking about. I woke my husband up the night I was reading this chapter, because I was laughing so hard over this chapter....it is so true! When you forget the end of a story, while telling it....no worries, just keep on talking. How true is that. Everyone might think you are crazy, but better crazy than old and forgetful! Tough Times, Tight Money: OMG, this chapter is "funny as sh*t." I don't know that I can add much more than that. What does one little brother, three older sisters, a barn slide and a bag of poo have in common? One funny story, that's what. Seriously, this chapter is "funny as sh*t," but I am not really sure what it has to do with the crappy part of life. Great story, though. Oh....I might have just gotten it! God Wants Us to Eat Up: Oh yes God does. I just wish everything I liked wasn't bad for me, full of calories and has a ton fat grams! I love this.....the Queen wrote, "Chocolate is GOOD for ME - so sorry if it is bad for YOU." I think the Queen is my long lost seester (sister)! The Queen writes about a cake in mug recipe and turns it into a brownie in a mug. I seriously have to try this. I LOVE brownies and would love to wipe one up in a mug. I am a little confused about putting the left over batter in the freezer, since I would end up licking the bowl clean. What left over batter? I am going to try this brownie in a mug tonight! Who knew you could sprinkle some Splenda on a yellow onion and substitute it for a Vidalia onion when they aren't in season. Hmmm, not sure I will try that one. I am not a big onion person but I did learn that little secret and so many more in this chapter. The Holidays: Horrifying Tales of Human Sacrifice: This chapter covers everything from Valentines to Christmas, birthday cakes to gifts and people-pleasers to family crap. The Queen LOVES Christmas letters - I do to. One of my favorite thing between Thanksgiving and News Year is to open a holiday card and find the annual news letter from someone is included. I immediately have to read it, no matter that I may be late to pick one of the kids at one of their many events. Christmas letters come first! The Queen also writes, "CARNATIONS: DON'T YOU DARE!" I have to say - 100% agree. My family was 3 generation flower shop owners and I can't stand carnations (not to mention I know how cheep they are). Guys, seriously....don't send or pick up carnations for that special someone in your life! I really did find Fat Is the New 30 pretty darn funny and so true (can't deny that, even though I want too!). Meet the Author: Jill Conner Browne is the multiple #1 New York Times bestselling author of nine Sweet Potato Queens® books and has created a global phenomenon--6,200 chapter groups in 37 countries--based upon her philosophy and world-view as recounted through these rollicking, raucous and riotously funny essays. Women and smart men understand that the bawdy, sassy, down-to-earth humor is simply the vehicle by which the greater message is conveyed--that is, one of self-reliance and empowerment, inspiring all to do what makes their hearts sing. Other Thoughts: Would love to read other Sweet Potato Queen books. I think the listening to them would be a hoot too!